We are renowned in the art of manufacturing Cross Road Full Face Helmet. 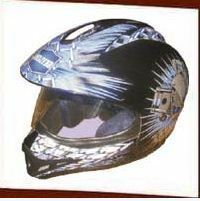 These helmets are manufactured as per the international safety and quality standards. An utmost care is taken during their fabrication and design so as to make them convenient equipment for increased efficiency. 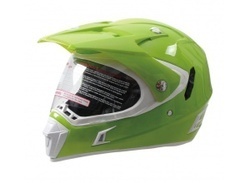 Banking on the individual requirement of the clients, we offer world-class range of Motor cross Helmet that is acclaimed for quality and long service life. Our entire range is crack-resistant in nature and is extremely light in nature. Owing to their sturdy construction, they are widely acknowledged among the clients. Injection molded ABS shell. PC visor, Anti-scratch, transparent and colorful ones are available, the visor can be replaced by hand without any tool. Removable and washable lining and cheek pads.